This project has been completed in 4 stages. I will quickly cover the first 3 stages (which contained no electronics) and detail out the 4 stage which was converting Frank into the operation game and adding audio and animatronics. I started by constructing the hand. I figured this would be the hardest part of the initial build and it defined the scale for the rest of the parts that needed to be fabricated. The hand was fabricated from PVC pipe and fiberglass resin to fill the void between the inner and outer hand. The head fabrication was next. It is made from PVC pipe (a large pipe fitting for the main part of the head), MDF, and resin to fill the void in the top nub. The legs are made from MDF and PVC to define the top leg curves. The arms (which ended up being the hardest part) were roughed out with PVC pipe foe the forearm, and MDF for the upper arm. Floral foam was used as a space filler. Bondo was used to create the upper arm shape, and tons of sanding and filling brought it to its final shape. The arms and hands were molded and cast with Smoothcast 300. Everything was painted based on the Monster Hunters Lego kit. This phase consisted of fabricating the Scientists hair. Tooling foam was cut using the band saw into the basic shapes of the hair wisps. The various parts of the hair pieces were glued together with epoxy. The entire hair piece was covered with Smoothcast 300 to create a plastic shell over the foam. it was then sanded and filled. Epoxy sculpt was used to fill in all the seams between the hair sections. It was primed and painted. The third phase was the construction of Frank's bed based on the Crazy Scientist and his Monster Lego kit. It is a simple box build made form MDF and PVC pipe for the nubs. The corner details were created with PVC pipe that sandwiched a disk of MDF. Everything was sanded, primed, and painted. The final part of this project (to date) is converting Frank into an operation game and adding both audio and motion to the Megafigs. I will detail out each body part of the build instead of going in chronological order of how things happened (everything was being worked on at the same time). The torso had 3D printed brackets added to the joints that held 2 roller skate bearings. These act as a pivot point for the arms and head. Frank's upper body had 2 candy dishes that were 3D printed, topped with milled aluminum lips, and covered with a new torso plate. The aluminum lips act as a switch for the operation game. When the tongs (that have are wired into the MP3 shield) touch the aluminum, it completes the circuit, activating the program. Both heads were modified to move and hold speakers. First a 3D printed bracket was added to the neck to hold 5/16th bolt that acts as an axle. Perforated metal was used as a guide to map out the holes for the speaker grill. I was the most nervous about this process. Any mistake would ruin my paint job on the faces. The holes were painted in to match the surrounding color. A 3D printed bracket was created to hold the speakers behind the speak grills. The new legs were 3D printed in two halves as well as a bone shaped candy dish. An aluminum plate was milled like the torso. The legs were bonded together, sanded, smoothed with bondo and painted. The original master for the arms were modified to accept a 3D printed bracket that held a 5/16th bold for an axle. They were then remolded, cast, cleaned up and painted. The servos were installed using 3D printed brackets and connected to the appendages via wire and an aluminum horn attached the 5/16th bolts. Springs were added later to assist with the lifting of the arms. All the electronics were mounted to a piece of MDF to create a prototype test bed. This setup allowed me and Daniel to figure out the programming, tweek stuff, and work out glitches. Everything worked well. 2: When an aluminum plate is activated, the MP3 shield plays the corresponding MP3 file and sends a signal to the servo Arduino. 3: When the servo arduino gets a signal from the MP3 shield, it runs the corresponding code for the servos. Both arduinos were mounted to the underside of Frank's bed, and everything rewired. Everything works fantastically and held up to a full night of abuse. For a more detailed build log, visit ... http://www.therpf.com/showthread.php?t=195101. There I detailed every step as I produced it. Connect GPIO 2, 3, 4 of the MP3 shield to the aluminum Plates. Connect 3v of the MP3 shield to the tongs. Connect pins 5, 8, 9 of the MP3 shiled to pins 2, 3, 4 of the servo Arduino. Connect pins 6, 7, 8, 9, 10, 11 of the servo Arduino to the servos. Wire the positive and negative of the servos to a 5v plug. Wire the graounds of both the servo Arduino and the MP3 shield to the 5v plug. Wire up both speaker inputs. These are the scaled and dimensioned drawings I used to construct the megafigs. This code is loaded onto the Arduino uno that controls all 6 servo motors. Basically it wait to receive one of 3 signals from the MP3 shield. 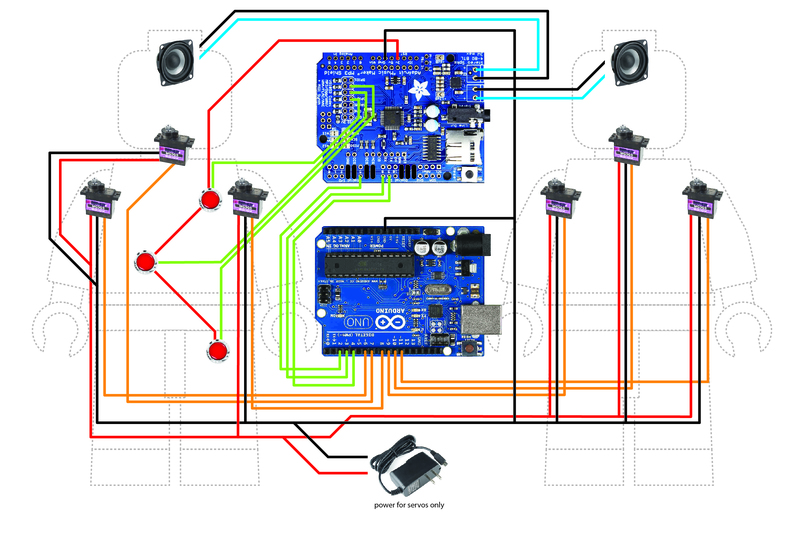 When the signal is received, the servo Arduino Uno runs the corresponding servo movements. // Digital Pins 0 and 1 are normally used for serial commucation when uploading and monitoring an Arduino from a computer. // Digital Pins 0 and 1 can be used for servos if the Arduino is not connected to a computer. // If Digital Pins 0 and 1 are being used for servos, comment out any lines beginning with 'Serial.' in this file. // Make sure this Arduino is powered on before the other Arduino since this Arduino will be receiving 5V signals. // Make sure a GND wire on this Arduino is connected to GND on the other Arduino. // Setup input pins so the Arduino with sound effects can tell us when to activate servos. // Easing functions from https://github.com/warrenm/AHEasing/blob/master/AHEasing/easing.c renamed to match http://easings.net/ for easy previewing. This code is loaded onto the Arduino Uno with the MP3 shield mounted to it. Basically it receives a signal from one of three switches, plays the corresponding audio file and send a signal the Arduino Uno controlling the servos. Two buttons can also be mounted to it to control volume. // Digital Pins 3, 4, 6, 7, 11, 12, and 13 are used by the Adafruit Music Maker Shield. // This Arduino should be powered on after the servos Arduino since this Arduino will be sending 5V signals. #define DREQ          3 // VS1053 Data request, ideally an Interrupt pin. See http://arduino.cc/en/Reference/attachInterrupt for more info. // Set volumes for the left and right channels. // Specify which GPIO pins to use for input. // Specify which digital pins we will use to communicate with the other Arduino (aka the Arduino with all the servos). delay(6000); // Customize delay to match end of servo movements, go by feel vs. accurate math since this Arduino's clock may not sync with the other Arduino.